Every so often, Wine To Water has the opportunity to capture moments like these: when a connection is made between those who build the filters and those who receive them. Doc took the picture above with the hope that Kari may see her filter soundly delivered and to tie the two worlds of Wine To Water together. Founder Doc Hendley and CEO David Cuthbert recognized the importance of this connection even in the earliest stages of the Wine To Water filter build program. The program was inspired by a company that reached out to do something more hands-on. Doc offered them the chance to help build filters with Wine To Water, and the company generously provided funding for the filters in addition to building the filters themselves. It was at one of the first official filter builds that David noticed there were notecards to spare, and so he encouraged participants to write notes. Regardless if the letters were short or long, David knew the connection each letter supplied would serve more than just the mission for clean water. Now, notes like Kari’s are greatly encouraged at every filter build. 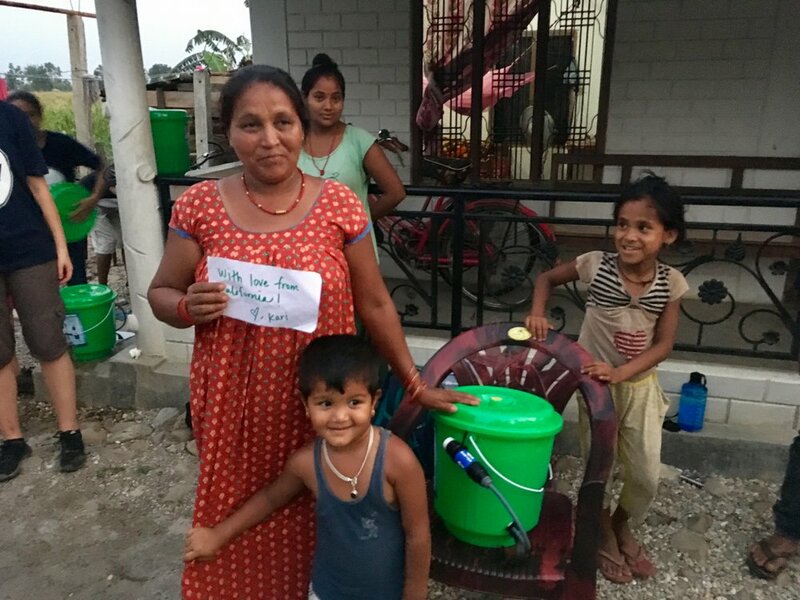 "What a treasured gift to be able to see a photo of the actual family that received the water filter that I assembled as part of Autodesk’s Global Month of Impact project with Wine to Water! By nature, doing volunteer work always feels good, knowing you’re contributing something to help others in need. However, being able to witness the real people who are direct beneficiaries of your volunteer efforts – now that feels incredible! It makes my volunteer efforts even more special and meaningful! When we were assembling these water filters, they strongly encouraged us to drop a personalized note along with it, but I never expected I’d actually get to see that note in the hands of the recipients! This was such an amazing surprise, and is truly a gift I hadn’t anticipated! It’s encouraging to see the impact and encourages me to continue to do more volunteer work to help others!" Though we cannot take pictures of every filter and note that is delivered, instances like these allow all contributors to see that their work is on the move and making a difference all around the world. A single water filter can change a family’s life for up to ten years, but one note creates a connection that will never run dry.